"This is Me" from the film "The Greatest Showman" was the winner of the best song Golden Globe Award and it has local ties. The winners are in! See who won big at the 75th annual Golden Globe Awards in Beverly Hills. 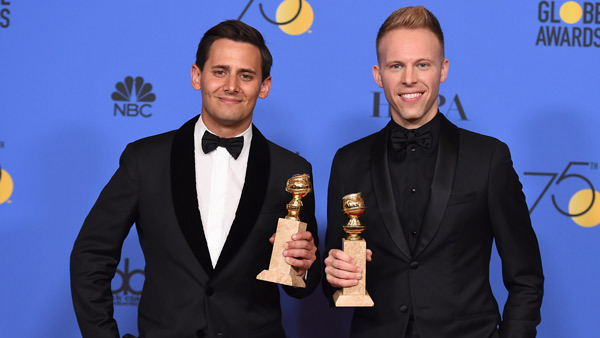 "The Greatest Showman" song is the work of Oscar-winning duo Ardmore native Benj Pasek, a graduate of Friends Central, and Justin Paul. The duo won an Academy Award for their song "City of Stars" in "La La Land." The "Showman" tune appears in the musical starring Hugh Jackman about the life of P.T. Barnum. "Every day in our house was like going to a Broadway show. That's how we got through breakfast. That's how we got through lunch," Benj's mother Kathy Hirsh-Pasek told Action News before the Oscars last year. La La Land is Oscar bound, and those behind the scenes have local connections. Carey, who was nominated for her song "The Star," helped announce the winner of the best original score honor, which went to Alexandre Desplat for "The Shape of Water."